Diarrhoea and septicaemia (usually under intensive conditions) - Kids usually under 2 weeks of age. The septicaemia being much more common. 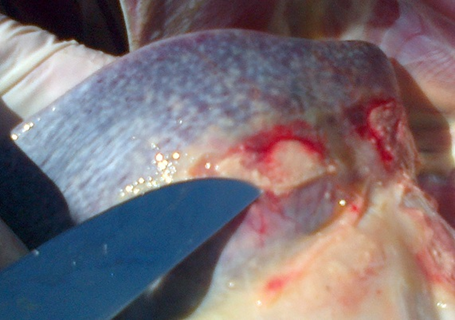 Miliary abscess formation has been diagnosed in young Angora rams that have been fed concentrate diets. How do Angora kids and young goats become infected? Transmission usually occurs by faecal oral route. 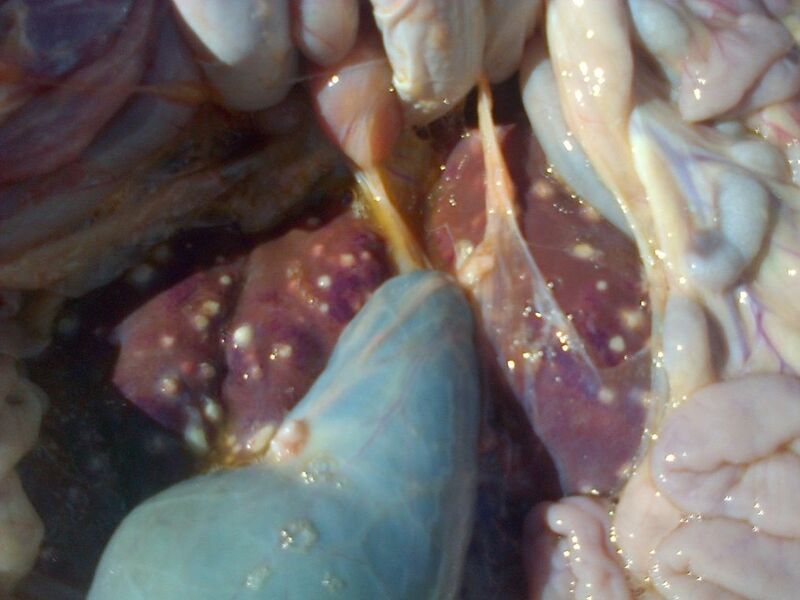 In the young Angora ram kids that developed miliary (E. coli) abscess’ the origin of this infection was likely to be from the digestive tract rather than the umbilicus. 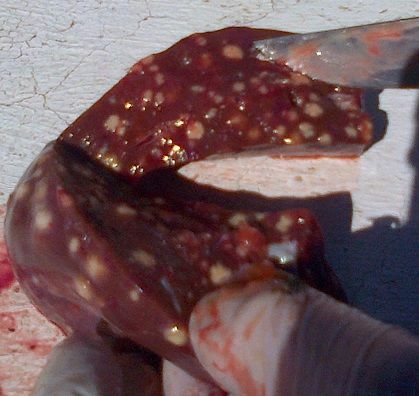 The umbilical venous blood flow in the foetus flows through the liver and does not disperse into it while that from the GIT disperses into the liver. This infection may have arisen from possible subclinical acidosis leading to the E.Coli entering the blood stream. The disease is acute and death within 1-3 days in young kids. opisthotonus (head pulled back) and leg paddling movements. In the cases where abscess formation occurred the main clinical finding was the weight loss and mild ascites. Post Mortem findings are often unspecific in young kids with the septiceamic form of E.coli infection. Congestion of SI with grey-yellow content. Mesenteric lymph nodes enlarged and oedematous. Sections of intestinal tract for bacterial identification and culture. As colisepticeamia more common in kids - treat with ‘purbac’ (trimethoprim/sulphonamide). Vaccines registered by OBP for sheep are available. Ewes are injected 10 and 6 weeks before kidding if not previously vaccinated and then a booster each year prior to kidding.